This particular anti-evolutionist argument pops up in two variations: “4 billion years isn’t long enough”, and “Millions of Years is a hoax”. Both are different arguments, and require different rebuttals. The former is an argument that evolution as we see it today is too slow a process to result in the amount of biodiversity we see on earth. While this may seem respectable on the surface, the only way it can be made is to completely ignore the incomprehensible amount of time that is “four billion years,” and the similarly incomprehensible amount of area that is “on earth”. To attempt to put that into perspective, that’s an entire planets chemical and biological ecosystem running for fifty million times as long as your entire life, for four-hundred thousand times as long as human civilisation itself, or for thirteen hundred times the amount of time it took us to evolve from tree-dwelling apes. In the face of such extreme time spans, the only real response to “not enough time” is “wait, you’re serious?”. The speed of evolution we’ve directly observed in nature is most assuredly not too slow for such a massive amount of time: here in reality, the speeds we’ve seen are quite a few orders of magnitude faster than what common descent would require. The reasons for it being so much faster are a combination of selective reporting (we only see evolution that happens fast enough for us to record in our lifetimes, which is the very fastest sub-group of evolution), and genetic variation (modern, sexual species can adapt very fast simply by leveraging the variation within their population and the power of recessive genes). What this argument usually boils down to is not “four billion years isn’t long enough”, it’s “no amount of time is long enough,” aka the Argument from Incredulity. Aside from being a logical fallacy, this particular argument would require some mechanism that will prevent the accumulation of mutations from resulting in large amounts of macroscopic change over enough time: the elusive “kind-barrier” for which anti-evolutionists never seem to be able to produce evidence of existence. The second and far more common variation on this argument is a religiously motivated one. Several religions, including Christianity and Islam, have creation narratives that imply that humans were created early in the piece, and started going through the whole “civilisation” phase very shortly after that, which rather contradicts what science has to say on the matter and caps the maximum age of the planet at somewhere between 6 and 15 thousand years old. Now before I go into the reasons this is untenable on a level that puts simple evolutionism-denialism to shame, I want to draw attention to the word “narrative” above. Religious creation stories are stories, they were written as stories, and I have heard highly convincing theological arguments from religious individuals that they should be read as such. It’s beyond the scope of this blog to go into those arguments, but suffice it to say I don’t think being a Christian means (or should mean) being a Young Earth Creationist (and likewise for Islam, and any other religion with a Young Earth subset). Young Earth Creationism might be religiously motivated, but it is not religion, and by trashing it here I mean no offense to the actual religious views it parasites off of (on the other hand, if you want to offend religious viewpoints that’s absolutely fine by me too. Total apathy means I’m pretty easy to get along with). Shorter me: I don’t believe any religion is perfectly compatible with an acceptance of reality, else I’d belong to that religion, but I do believe many of them are not incompatible, double-negative notwithstanding. That’s a map of the major meteorite impact craters on earth… well, the ones we know about and can positively identify as impact structures. 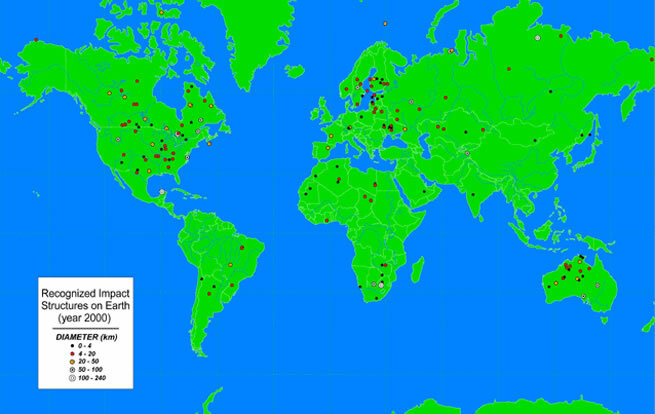 As you can see, there’s loads: 160, to be exact. And they’re almost all on land, because it’s a lot harder to find underwater craters. Not taking into account erosion and tectonic plate movement or the fact that a water impact doesn’t leave a mark, 450 impacts would be a very conservative estimate. That’s the far side of the moon. The moon has 1/6th of our gravity, so it’s likely only been hit by 1/6th the number of meteorites as us. 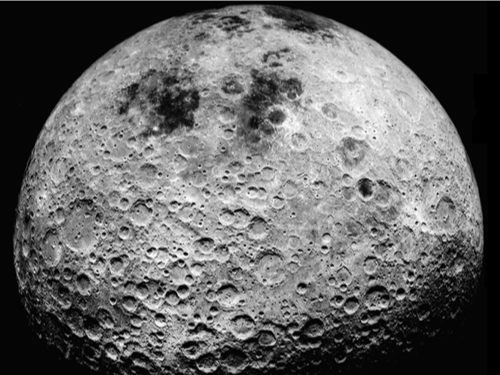 There are over 250 craters with a diameter of 100 km or more on the moon. The math isn’t terribly difficult, and it gives a number 3 times larger than 450 (using a huge cut-off, too. 250 OVER 100km wide), giving us a good idea of how thoroughly erosion has affected our plant. Now, on a young earth, even the tiny value of 450 impacts is one impact every two decades or so. And yet we’ve only seen a small number of confirmed meteorite strikes in all of recorded history, and never of the size we’re talking about here. So that doesn’t make sense for a start. The other option for Young Earthers, and one a few denialist organisation have gladly clung to, is that the impacts all occurred all at once in some sort of global catastrophe. Indeed, a few creation stories conveniently describe catastrophic events that can be have meteors shanghaied in with a bit of imagination. But many of these impacts would be enough to cause a dramatic local extinction: several are big enough to cause a global extinction, and one or two are large enough to scythe all life bigger than an insect off the planet. All of these at once would make the earth completely unliveable for millennia. Bacteria would have a hard time surviving. Roaches wouldn’t stand a chance. Life on a young earth would have been pummelled into submission years ago. The earth is old. More than old enough to support evolution and common descent. And unlike biological evolution, which requires a bit of thought to understand, the evidence for an old earth is as simple and incontrovertible as “Rocks Fall Everyone Dies”. This is a personal blog too, right? So if I see a post I like, for instance, one written by a Liberal Christian on the folly that is Young Earth Creationism (and by extension, Antievolution), I’m not breaking my “no ragging on religon” rule by linking to it and am in fact perfectly justified in doing so, right? Right? The only thing I have to add to all that is that if you don’t occasionally revel in how utterly huge, spectacular, insanely complicated and purely awesome the universe is, you’re missing out. Everytime he breaks a completely arbitrary rule he invented himself for an obscure internet site, I have to kill a puppy. WHO THE HELL CAME UP WITH THAT RULE?! PS: Don’t worry, I’ll be talking about Species (ie. actually On Topic) in the next post.